It’s just over 2 weeks since London’s cycle hire scheme launched here in London. As is expected – and warned of by the Mayor – the launch of the scheme has not been entirely smooth-running. At times users have reported there not being enough bikes (or available docking points) in the right place at the right time, as well as issues with membership, the call centre, the website and the software at the docking stations. Indeed, so problematic have some of these software issues been that the full launch of the scheme, which will enable casual users to hire bikes on a turn-up-and-ride basis, has been postponed again whilst attempts to resolve all these problems are made. Despite the warnings from the Mayor about the probability of there being issues with the launch of the scheme, and the risk associated with being a “Pioneer Member” , it would seem that we’ve been signing up in droves to use London’s newest form of public transport. Some 45,000 individuals have now joined the scheme, and together they’ve made over 100,000 cycle hire journeys between them. In an email to all members on Saturday the 14th of August, David Brown the MD of Surface Transport at TfL wrote; “The busiest day last week was Wednesday 11th August when almost 14,000 journeys were undertaken over the course of 24 hours. What we’ve found really interesting is that 93 per cent of all journeys have been half an hour or less and therefore, after the access charge, completely free!” When you compare this to the cost of a single bus or Tube journey it’s easy to see why people are taking to the scheme – it helps that the area covers the Congestion Zone where private traffic is lower than in many of the surrounding Boroughs and traffic speed averages out at about 12mph. Sustrans have been calling for the scheme to be replicated in the outer Boroughs but I can see little appetite for casual cyclists to informally use a bike where traffic levels are greater and roads are faster. I do however believe that the scheme should be expanded to cover all of inner London (much more within Zone 1 and an expansion into Zone 2). Talk of financing an extension of the scheme east towards the Olympic Park and Canary Wharf – as well as increasing the number of docking stations within the existing hire area – are already on the table at TfL and due for discussion soon. As a cyclist, have you joined the hire scheme? 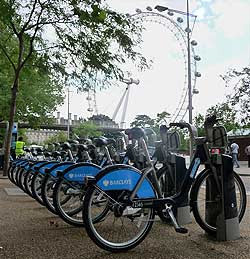 How have you found the experience (I should add that I have had no trouble with docking stations or the website when I’ve needed to use it, my only problem has been docks running out of bikes when I’ve wanted to hire a bike come ‘home time’) Are problems to be expected so early in the scheme? Do you think such a scheme could work in other towns and cities around the country, what might stop the scheme succeding elsewhere? (See my earlier post on why bike hire and helmets don't mix) Is all this money being spent on cycle hire schemes really just a diversion and could the money be better spent on cycling infrastructure, or training for kids? I’m keen to hear all your thoughts! I used one for the first time on Saturday. Had to remind myself that my normal commuting speeds were unachievable and that going slow is ok for the weekend. The gears could be better for fitter cyclists (1 too low, 3 not high enough). But, they are good enough for a quick 'sit-up-and-beg' style ride when you don't want to bring your expensive commuting bike along and risk it being stolen. No problems with docking stations. I got a receipt as was advised in case they over charged me. There were plenty of bikes in Shoreditch and Exmouth Market to be had. On a side note, this morning I saw a policeman booking a Boris Bike rider on Oxford Street. They were cycling up the pavement riding east. It seems like I've been mostly very lucky with the cycle hire scheme compared to what I've read on the internet by others - I've heard some real horror stories but by comparison my experience has been extremely smooth. However, when I tried to use the scheme at 6PM on Tuesday the 7 docking stations closest to my office were all empty. I think they are having issues re-distributing the bikes and because of the current set up the flow of bikes is very commuter based. Perhaps once they open the sceme to tourists and casual users there will be less of a tidal flow of bikes? Sheffield Cycle Chic; I am so glad I haven't had an experience like yours!